You may recall last month we ventured back to Meso-America 7,000 B.C. with Ayrlego‘s beautiful jungle scene. Now we leap through time and space to the Golden age of Piracy with two wonderful buildings from the fictional Port Woodhouse. First, we have the piratically themed Infantry Barracks where the Captain inspects the troops’ custom carbines. I love how each of the soldiers has a unique face and expression – a couple of those guys in the front row look like a lot of trouble or a lot of fun, depending on your perspective. The use of older ‘yellowed’ white bricks and un-clutched roof tiles (including one with a broken corner) also lend the build an antique feel. Next we have the Armoury, built as a free-build for Brethren of the Brickseas over at Eurobricks. 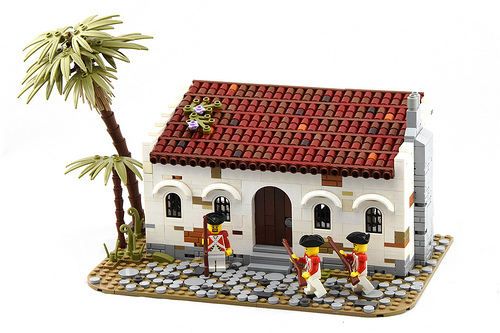 The builder has managed to emulate ‘classic’ LEGO Pirates but adding their own modern flair. Again, the roof tiles are textured and coloured and look delightful – while the olive green and purple plants on the roof really sets it off. Inside, a grizzled old master-at-arms with a missing leg inspects the custom pistol of a nearby Winged Hussar. The gun racks, fireplace, table and hat rack all look like they belong there. 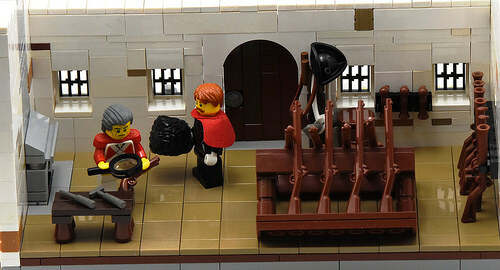 The master-at-arms may not look too impressed peering through his magnifying glass – but I certainly am – I look forward to visiting Port Woodhouse in the future to see what Ayrlego comes up with next.